A Special General Meeting was held on May 25 in Saskatoon to determine the results of the Special Resolution that was distributed to members earlier in the month. The Resolution passed with a large majority, and it enables our currently sitting Directors to remain in place for an additional year, through a one-time term length extension. As a result, there will be no call for nominations or Board of Directors elections conducted at this year’s AGM. 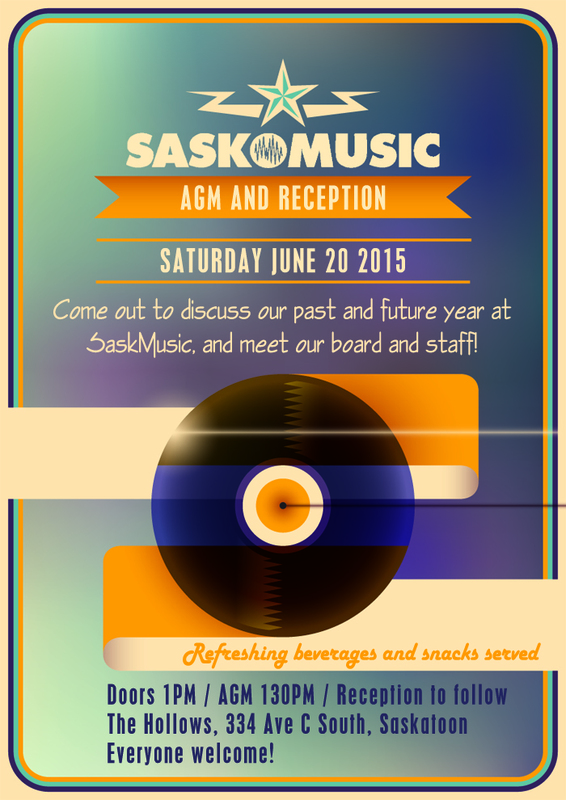 Please join us in Saskatoon on Saturday, June 20, 2015. You must be an Individual, Band or Corporate Member of SaskMusic to vote on any motions presented during this meeting. Youth members and guests of members are welcome to attend as observers. Members and non-members alike are invited to join us for the reception portion. A reception, open to everyone, will follow the AGM. Please join us for some lovely refreshing beverages and snacks!